Peanut butter doesn't grow on bushes, but if you smell the fragrant fruit and leaves of the Peanut Butter Tree/Bush you might think it does! 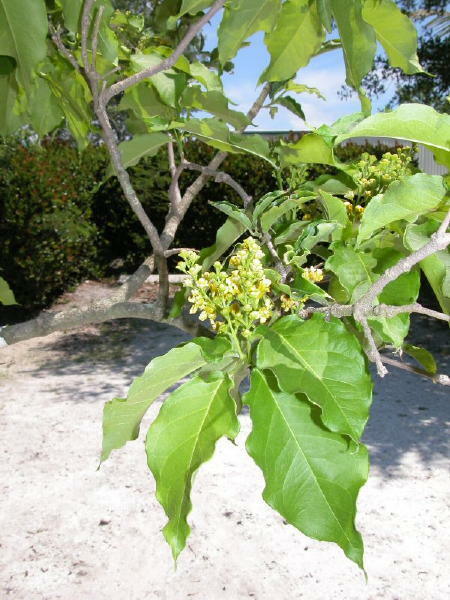 This attractive tree has clusters of yellow flowers that are followed by an abundance of edible dark red fruit to around 2cm long. The rich, sweet flesh has a texture similar to peanut butter and tastes like peanut butter mixed with other nuts, or even figs and plums. Eat fruit when just ripening into orange for the crunchiest peanut butter flavour, and pick when a fully ripe red for a sweeter taste. The fruit can be eaten fresh or made into milk shakes etc. The plant is quick growing and fruit is produced when the plant is still quite young, usually one to two years old. Part shade is best as it is a rainforest tree. Water well for quickest growth and to encourage greater fruit production (if left to naturalise on mainly the rainfall of your climate the growth rate may be slower and less fruit produced). Mulch well. Very frost tolerant, however also grows well in tropical areas.